In 1985 we got our first microwave and it opened up a whole new world of convenience food for me. 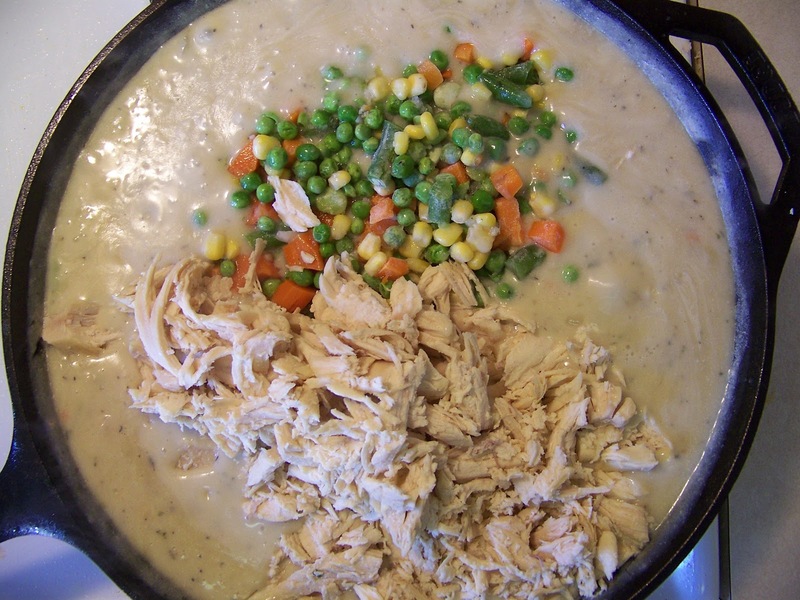 Microwave meals were pretty darn cool back then (well we didn't know better) and I loved these single serving Chicken a la King frozen meals my mother would buy for me to eat after school. I would pop it into the microwave and simply pour the creamy chicken and vegetables over some buttered toast and it tasted beyond wonderful. I have not had chicken a la King in decades but I recently thought about it and it gave me a major craving to taste that creamy chicken over toast again. I created this one pot dish from stove to oven and it was way better than any of those frozen entrees from back in the day. It was simply scrumptious and it came together so easily. I poached my own chicken and made some stock while doing it, but you can easily make this with rotisserie chicken and some canned chicken broth. 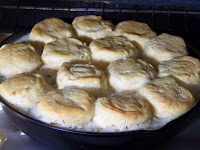 I did take help from the store with some store bought biscuits from Pillsbury and served it right out my caste iron skillet. I scored another 10 fingers up (my kid's way of saying lots of thumbs up) and my husband tried really hard not to have 3rd helpings. I will definitely not wait decades to eat Chicken a la King again. Actually, I've got it schedule for dinner again next week. Bring all the ingredients to a boil then lower to a gentle simmer for 20-25 minutes. 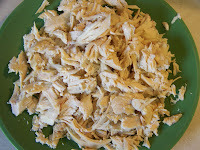 Remove chicken to cool and shred. Reserve poaching liquid to use later. 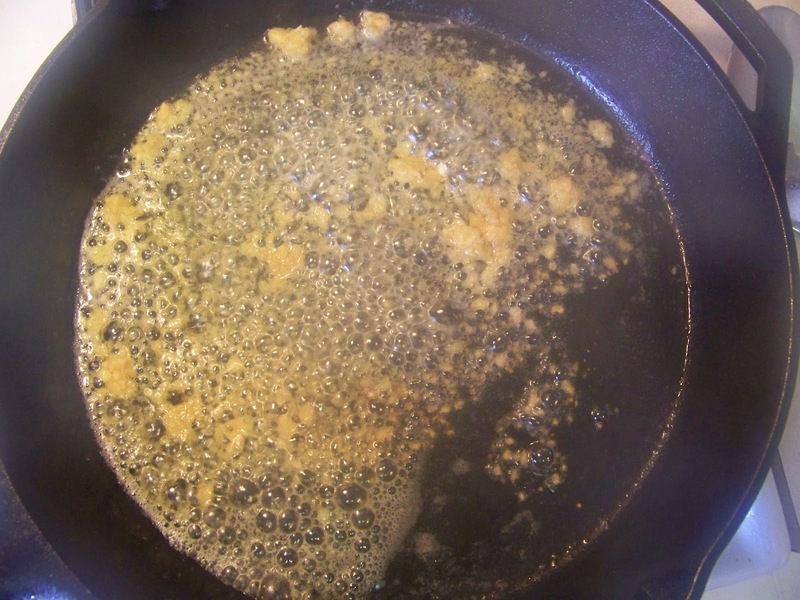 In a oven safe skillet (like a caste iron pan) heat your butter and oil. Add garlic and allow to fry for 30-45 seconds. Then add chopped onions, celery, carrots, salt and dried thyme. 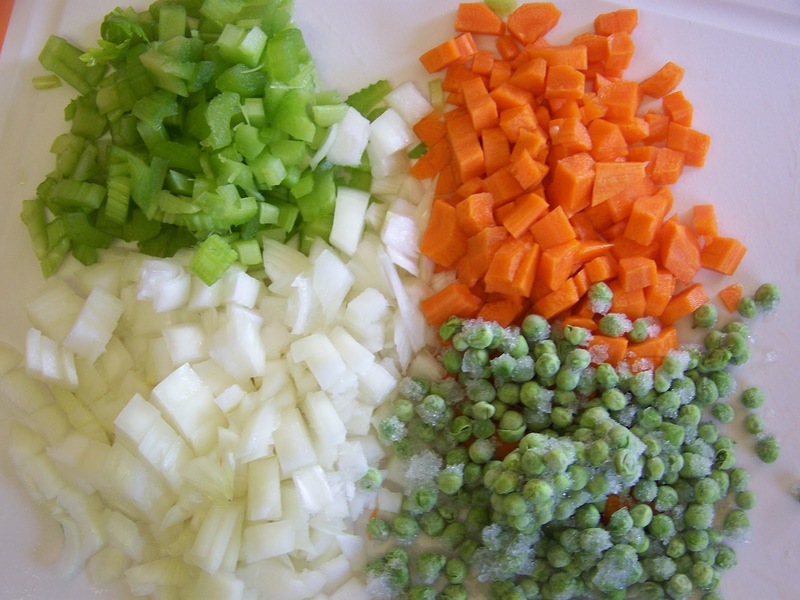 Note: the broth will add salt to the dish so be conservative when you add salt here. Next add flour. 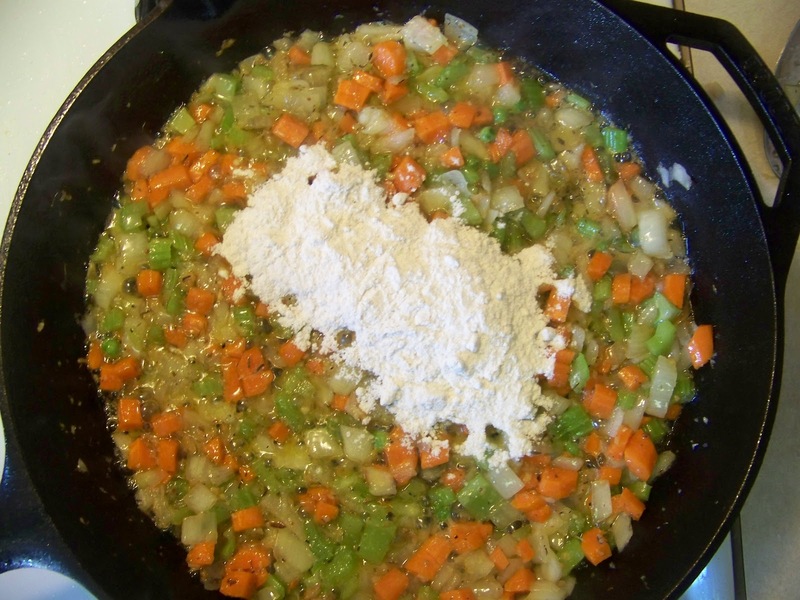 You need equal parts flour to fat here to make a roux. 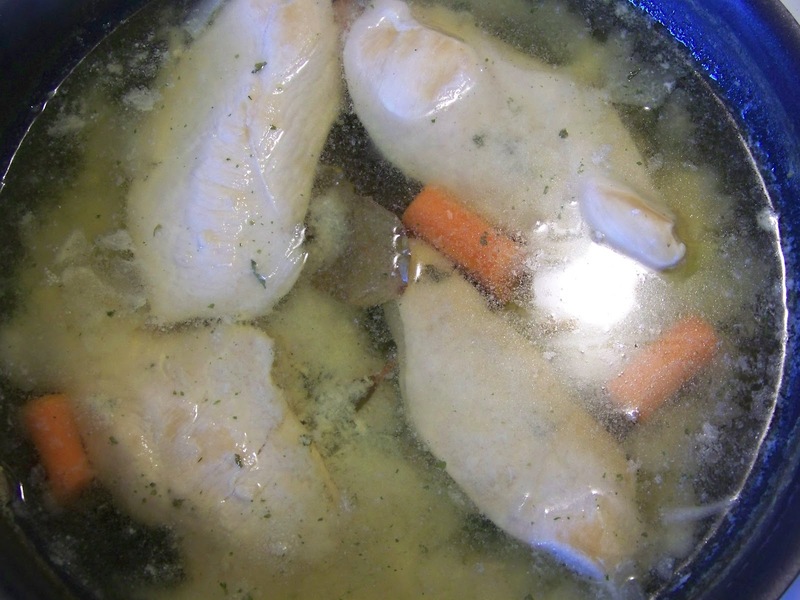 Cook roux for a 2 minutes and then add chicken broth or poaching liquid to the pan. 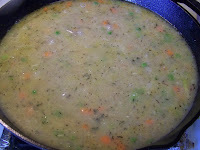 Stir well until gravy is smooth. 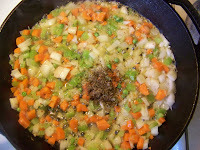 Allow gravy to simmer until it thickens. Note: If the gravy looks thin, add a little more flour by mixing flour with a little water in a separate bowl and adding it to the gravy. Next add milk or cream. Stir well. Taste for seasoning. Add salt and seasoning as needed here. When the gravy is at the right taste and consistency, add the frozen peas and shredded chicken to the pan. 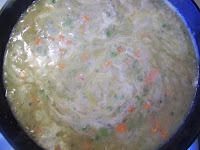 Allow everything to gently simmer for 5 minutes. 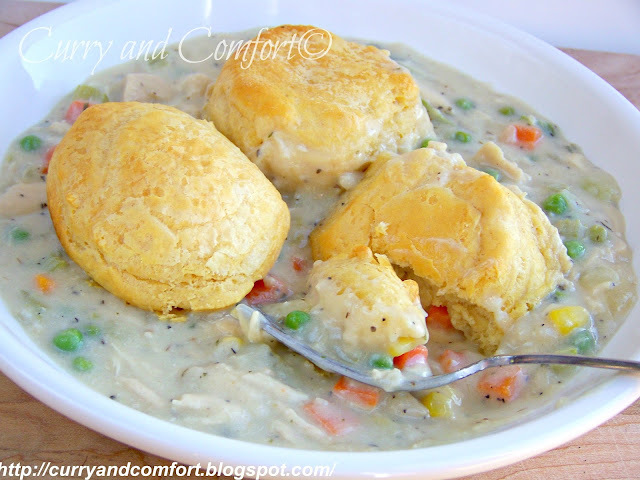 When the creamed vegetables and chicken are cooked to your taste, turn off the stove and top with your favorite biscuits. 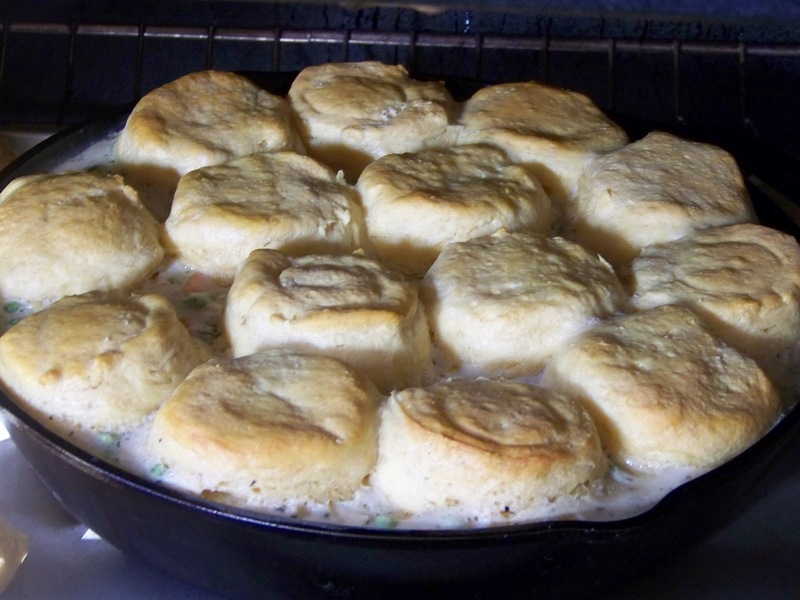 Place in the oven and bake until the biscuits are cooked through and browned. Serve hot. Enjoy. 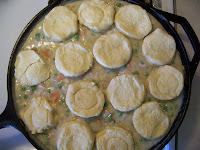 Note: I suggest you place your skillet on a baking sheet so it is easy to move in and out of the oven and will catch any spills if the gravy decides to bubble in the oven. This looks fantastic Ramona!! Microwave meals were never a part of Indian households... in fact a microwave itself is a new fangled kitchen appliance here :D So chicken a la king is not something we are too familiar with. 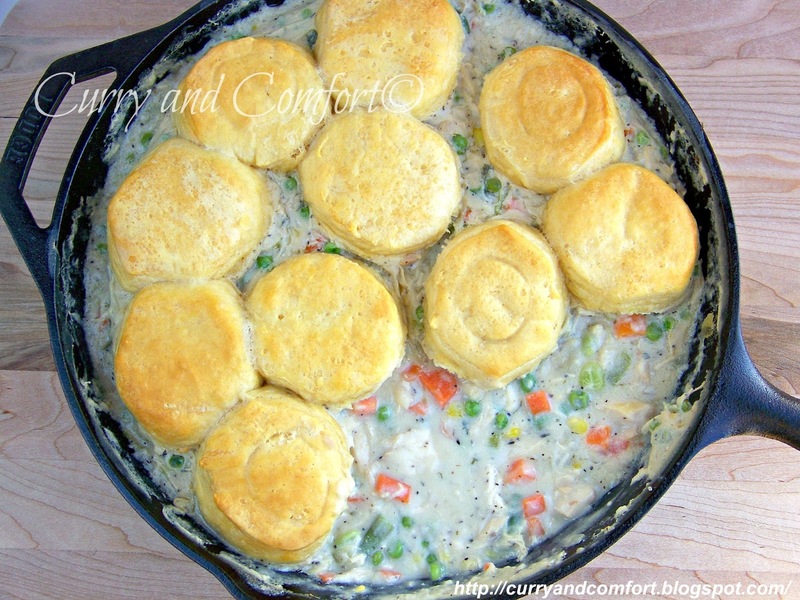 But your post makes it sound simple and creamy and yummy and I am dying to try it!! Looks really good. I remember the Stouffers chicken ala king over toast or a biscuit. My husband mentioned that he would like chicken ala king again too so I found a recipe but I didn't really like it. My hubby said it was ok. This one looks so much better, and I want to try it soon. There's something about it, isn't there, that is so comforting. You've got me drooling here Girl! 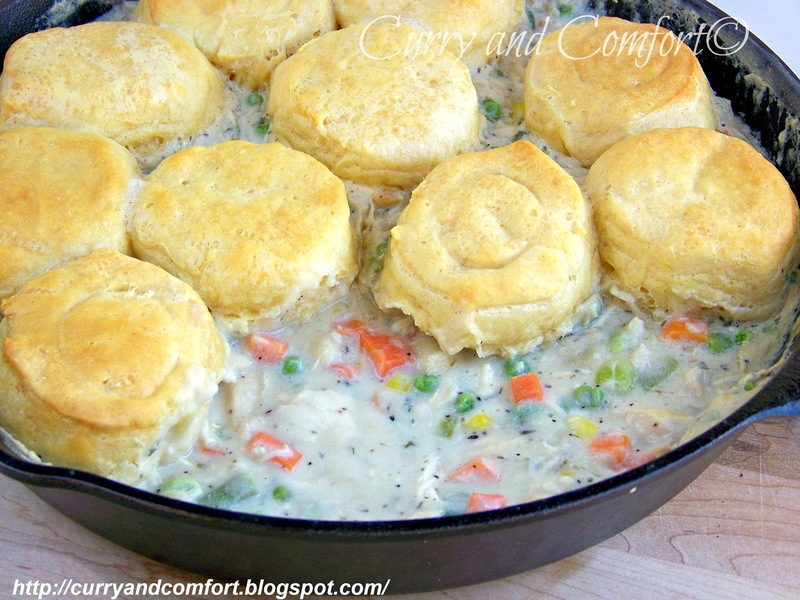 I love chicken a la king and your biscuit on top are just irresistibly perfect! I love the features that you add, you have very good ideas. Not to mention great recipes. 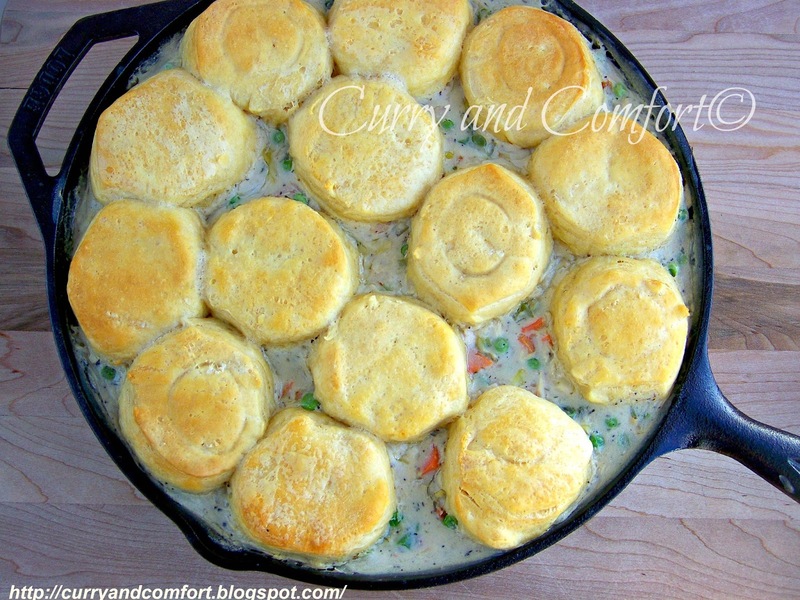 How did you get the biscuits not to be soggy when cooked on top? I made it last night. It was great!